It's one of those crisp, beautiful, fall evenings, and Chris Hooper and Lanny Hussey of Vancouver's own Ginger are relaxing across the table from me in a loud Yaletown establishment. To my left, unassuming Ginger frontman Tom Hooper -- brother of Chris and Saltspring Island resident -- sits comfortably, eyes wandering (like the rest of us) to the overbearing television screens broadcasting Canucks hockey. We're all hoisting sleeves of Moosehead, the home team is winning handily on the tube, and everyone seems at ease with themselves. Life is peachy, and I haven't even begun my interrogations into music matters. Most of you probably know by now that the Hooper Brothers (along with Kevin Kane and ex-Gingerite Vince Jones) were once the crux of West Coast artsy-pop rockers the Grapes of Wrath. 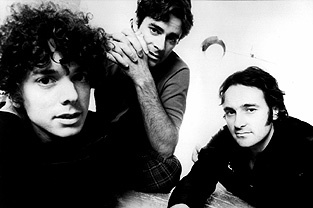 After ten successful years of recording and touring, the Grapes "divorced" in 1992, with Kane going the solo route and the other three members reforming under the Ginger namesake. Far Out, Ginger's debut full-length disc, was released in 1994 to considerable acclaim throughout their native land, with a 6-song EP put out previous to that, in 1993. Suddenly I Came to My Senses is Ginger's latest recording, and as adventurous and modern as the album sounds (included are funky drum loops, eccentric moods, and even 3-D "anti-interactive" CD-ROM capabilities), Tom Hooper's writing style still retains the organic, Beatles-eque sound made popular from classic Grapes' records like Now and Again and Treehouse. Which leads into my prying into Ginger's collective mindset when writing for Suddenly.... Tom? "I think I would use the analogy that when you have a lot of success in the past, like we had with Grapes, you come to realize that you just do what you do. It worked before so why not do it [again], that's what people like. After a while, you're constantly touring and you don't get a chance to expand your horizons or even listen to new music. You get in the same old rut and this record was a conscious effort to try to get out of that rut." This release having been recorded at both San Francisco's Brilliant Studios and Nettwerk's Slack Studios in Vancouver, I wondered what had led the band to the recording stint south of the border. "My partner, Suzanne [Little, singer/songwriter and expectant mother of the couple's second child], made a record down in San Francisco, and I went down with her to play bass," states Tom. "[Brilliant] is an awesome studio, it's an old warehouse with three levels, the tracking room is so huge that it's got trees growing in it! It's been around awhile... "
"Since the mid-1800's," interjects Chris. "Stone floors, brick walls. It just made us play better. We lived there for almost a month." Giving my best Bruce Allen stare, I ponder whether the Stateside recording disqualifies Ginger as being a "Canadian" band. "We're only 75% CanCon on this record," says Chris. One aspect of the new CD that I'm particularly fond of is the amount of experimentation and diversity that transpires throughout, yet Suddenly... still manages to remain a very fluid and listenable piece of work/art, almost similar to a Sarah McLachlan album (Sarah in fact contributed back-up vocals). And while the disc has no shortage of radio-friendly material ("It's gonna be a Thriller, every song will be a single," laughs Tom), the blissfully sweet, sometimes sour songs allow the listener to travel amidst the sounds, savouring different tastes and textures which really seems to be the record's pretext. The last time I caught wind of Ginger playing locally was at the excellent Nettwerk 10th Anniversary concert, which was a while back (February of '95). I note that the band seems anxious to hit the road. "We leave on the 27th [of November] by ourselves with bands backing us up," Chris responds. "We'll be playing almost every night. In the new year we'll get into a lot more touring, but we've got to get out now while the video's being played [for "Everything You're Missing"] and we're getting good airplay, so... "
Finally, I questioned Ginger regarding their wishes for the Yuletide season and, like most brothers, they gave me two different answers. "I want everyone to just give Suddenly... a listen, you know what I mean? We try to make interesting music, something that would make me go out and buy a record," states Tom earnestly. Chris brings specific aspirations into the equation: "I want the Beatles box-set of videos!" Go on, root for the home team and give Ginger a(nother) listen. It only makes Sense. Grab a copy of the new CD and then hoist a few with Ginger at the Town Pump, Friday, December 13th.